was a powerful solar storm in 1859 during solar cycle 10. It produced the largest known solar flare, which was observed and recorded by Richard C. Carrington. What did Richard Carrington see in 1859? Way back before we had the Internet and telephones and electrical wiring – more than 150 years ago – scientists learned how solar flares can play havoc with manmade technologies. They also connected solar flares to the fantastic displays of auroral light, usually seen only at far northern and southern latitudes. And this discovery was completely by accident. Englishman Richard Carrington is credited with the key observation in 1859 that connected solar flares with communications disruptions as well as the aurora borealis. Carrington was a wealthy astronomer who dutifully recorded sunspots in his observatory at his estate in Redhill not far from London. His father owned the Royal Brewery in a nearby town and had urged his son to attend seminary. Carrington, however, was more interested in math and astronomy. After completing his studies at Trinity College, he went to work at the University of Durham observatory. After three years there, he was frustrated with the university’s inability to purchase new instruments for the observatory. In 1852, he decided to resign and use his family’s wealth to build his own house with an attached observatory and state-of-the-art telescope. He completed his observatory in 1854, employed an assistant, and worked on cataloging stars. One project, a catalog of circumpolar stars, earned him a gold medal from the Royal Astronomical Society in 1859. But he was also interested in the sun. 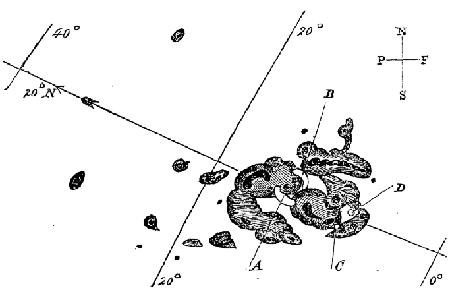 Astronomer Richard Carrington’s original hand drawing of the solar flare he observed on Sept. 1, 1859. Points A and B indicate where the flares broke out. Points C and D indicate where they faded out. The darkened areas show sunspots. Working away in his observatory on Sept. 1, 1859, Carrington was doing one of the most mundane things that scientists do – collecting data – when a massive solar flare exploded. He was lucky enough to be in the right place at the right time, and so this first human-observed solar flare is known as the Carrington Event. Lacking anything like an X-ray telescope, which modern astronomers use to study the sun, he worked by projecting an image of the sun from his optical telescope onto a large white screen. Looking at the sun directly through the telescope could have damaged his eyes. The shadows of crossed wires on the screen allowed him to time the transit of sunspots across the surface of the sun. 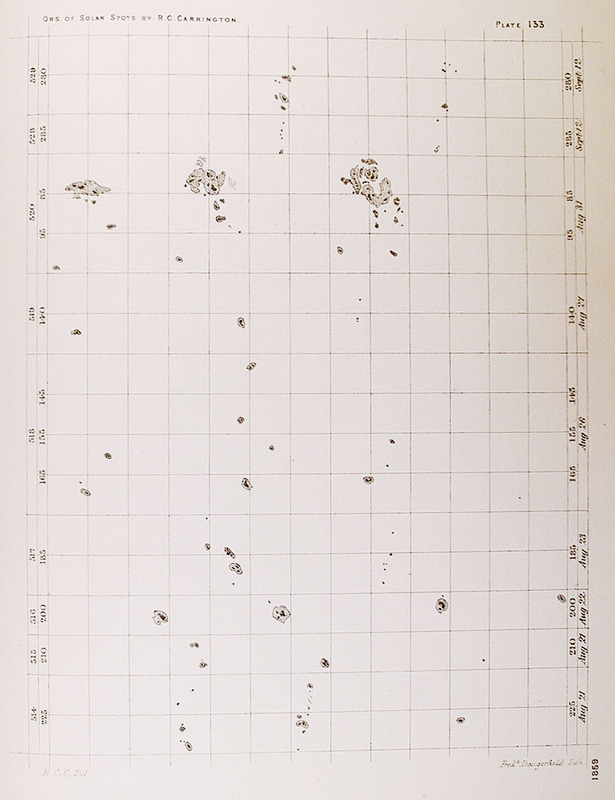 We know now that sunspots are caused by intense magnetic activity, but in 1859, the nature of these darks spots on the bright surface of the sun was not well understood. Nonetheless, Carrington recorded the date and time that sunspot images intersected with the shadows of his wires. He also drew diagrams of the spots he observed. On Sept. 1, Carrington “was engaged at the time in counting from a chronometer and recording the contacts of the spots with cross-wires used in the observation, when…two patches of intensely bright light broke out,” according to a paper he published later in the Monthly Notices of the Royal Astronomical Society. These patches of light quickly intensified. Carrington’s first thought, he wrote, was that light had penetrated a hole in his screen. But, as the bright light moved with the sunspot image, he realized there was no hole in his screen. “I thereupon noted down the time by the chronometer, and seeing the outburst to be very rapidly on the increase, and being somewhat flurried by the surprise, I hastily ran to call someone to witness the exhibition with me, and on returning within 60 seconds, was mortified to find that it was already much changed and enfeebled. Very shortly afterwards the last trace was gone,” he wrote in his journal article. Carrington’s careful observations and data collection are what enabled scientists to connect the solar flare to the surprising events that followed on its heels. Since 1859, scientists have observed thousands of solar flares, but none have matched the intensity of the Carrington Event. Carrington’s observations also opened many new questions for astronomers. Much of what we know now about how solar flares interact with the Earth’s atmosphere and magnetic field started with those questions. Within 18 hours of Carrington’s solar flare, Earth was engulfed in perhaps the largest geomagnetic storm ever, which sent compass needles swinging erratically and lit the skies with shimmering auroras. The legacy of Carrington’s work continues today through research conducted by NOAA’s Space Weather Prediction Center. Howard Singer, Ph.D., chief scientist in the NOAA Space Weather Prediction Center’s Space Weather Services Branch, explains that fast-moving energetic particles and slower-moving solar matter erupt from the sun’s atmosphere during a solar flare. The solar matter thrown into space is known as a coronal mass ejection, or CME. “It’s like a blob of material exploding out into the solar wind and travelling as much as five or six times faster than the typical background solar wind,” Singer says. When a CME hits the Earth’s magnetopause — the boundary between Earth’s magnetic field and the solar wind — interactions between solar matter and Earth’s own magnetic fields cause a geomagnetic storm. These storms can interfere with our power grids and communication and navigation systems. Interference can range from minor to extreme, depending on the intensity of the storm. In 1859, there were no power grids, and our only telecommunication system was the telegraph. But the solar storm had its impacts even then. Telegraph operators were among the first to notice the effects of the massive solar flare and subsequent geomagnetic storm. Operators in North America and Europe were unable to send messages. Some received electric shocks from their equipment. In some cases, sparks set paper near the telegraph ablaze. Boston – “Mine is also disconnected and we are working with the auroral current. How do you receive my writing?" The New Orleans Daily Picayune reported on Aug. 29, 1859, that crowds gathered on street corners to watch the aurora. Some feared that it was a warning of an impending disaster or epidemic. People in Boston assumed that their sky had reddened due to a fire until the red color changed to green spires of light, according to the Boston Transcript on Sept. 5, 1859. August 28 - September 2, 1859 - The Storm of 1859 was the first event recorded by humans from a truly global perspective, not to be repeated until the eruption of Krakatoa in 1883 turned the sunsets red and crimson the world-over. Newspapers such as the New York Times were active in running extensive stories about the 1859 solar storm, and collecting reports from other countries. The great geomagnetic storm of 1859 is really composed of two closely spaced massive worldwide auroral events. The first event began on August 28th and the second began on September 2nd. It is the storm on September 2nd that results from the Carrington-Hodgson white light flare that occurred on the sun September 1st. On Sunday evening (in Vermont), the 28th ult., at seven and a half o'clock, we were notified of a large fire behind the mountain at the north, and we went out to see it: and presently the red clouds began to disappear, and spires of green shot up from the same place. It was the most magnificent display ever witnessed in this section; the sky for about an hour more kept changing from green to red, till ten and a half o'clock, when all the brilliancy was gone, except a little green at the north…[Boston Transcript, Monday, September 5, 1859]. …The sky was completely overarched at one time, and then the entire firmament presented a gorgeous spectacle, as the jets of light streaming up from all quarters were of different hues…[Boston Daily Evening Transcript, Monday evening, August 29, 1859]. …At all events, we know of no known cause that would produce such celerity of motion as these merry dancers seemed to have, unless it be galvanism and not electricity…[Boston Transcript, Monday, August 29, 1859]. …The Aurora Borealis seen from the summit of Mount Washington on the night of the 25th of August, 1853 [sic], was next morning followed by an atmosphere so clear that the spires of the churches at Portland, 95 miles distant, were distinctly seen from the summit of the mountain, and at the same time a most brilliant meteoric shower was seen from the ocean near the equator…[Boston Transcript, August 30, 1859]. …At one time the northern portion of the heavens assumed an almost blood red appearance, while here and there long streaks of light shot up from the horizon to the zenith. These rapidly changed their place and their form until they extended over the greater part of the sky, breaking through the reddish hues and finally covering nearly the whole face of the heavens…[New York Herald, August 29, 1859]. …Objects at a distance could be more readily and clearly distinguished than when the moon is at its full. Now vivid arrows of light of most exceeding brilliancy shot up from the whole northern horizon; and, retreating, would again shoot higher and higher, until they covered the whole sky. This continued to grow darker, first to scarlet, then to crimson, and finally to the blood-red like appearance of an immense conflagration. The whole sky appeared mottled-red, the arrows of fire shooting up from the north, like a terrible bombardment, of which we could see all and hear none, while the stars of greater magnitude shone through like sentry lights…Correspondence of the Journal of Commerce, Cleveland, Ohio [Washington Daily National Intelligencer, Friday, September 2, 1859]. …was of extraordinary brilliance. There was a ghastly splendor over the horizon of the North, from which fantastic spires of light shot up, and a rosy glow extended, like a vapor tinged with fire, to the zenith…[Cincinnati Daily Commercial, August 29, 1859]. …The light appeared in streams, sometimes of a pure milky whiteness and sometimes of a light crimson. The white and rose-red waves of light as they swept to and from the corona were beautiful beyond description, and a friend near by us, while looking to the zenith with the whole heavens and earth lighted up at a greater brilliancy than is afforded by the full moon, said that it was like resting beneath the wings of the Almighty. The crown above, indeed, seemed like a throne of silver, purple and crimson, hung and spread out with curtains or wings of dazzling beauty. The tremulous motion of moving light, which the inhabitants of the Shetland Islands call "the merry dancers," was less apparent than usual, but in place of it came those full, bright, changing, but more steady streams of light, which gave an intense brilliancy to the whole heavens…[Washington Daily National Intelligencer, Wednesday, August 31, 1859]. …During the first display the whole of the northern hemisphere was as light as though the sun had set an hour before, and luminous waves rolled up in quick succession as far as the zenith, some a brilliancy sufficient to cast a perceptible shadow on the ground…[The Times London, September 6, 1859]. …Some who saw the display attributed it to fires in the towns about…[Rochester Union & Advertizer NY, Friday, September 2, 1859]. …About 10 [PM] a tremulous flashing up from the east was observed - soon after a bank-like arc of a circle was seen in the North, below which, the appearance was very somber, resembling a very dark cloud. From this arc soon shout [sic] up columns of light toward the zenith. This was immediately succeeded by the most lively and brilliant succession of flashes, forcinbly [sic]reminding one of that prophetic scene described by St. Peter, whose language is - "Wherein the heavens being on fire shall be dissolved, and the elements shall melt with fervent heat." This grand and sublime exhibition was succeeded by another brilliant display of columns of light shooting up again from the arc, with a slight show of the merry dancers. Soon after this the light gradually faded and ceased to attract much notice…[Boston Transcript, Saturday September 2, 1859]. …When first seen, the aurora omitted [sic] a thin pale light, which flashed up toward the center of the overhanging arch. Simultaneous with these flashes, long illuminated lines extended to the same point, which became redder and redder, till one assumed nearly a crimson color…[Boston Transcript, Sat. September 3, 1859]. …"The auroral light sometimes is composed of threads like the silken warp of a web; these sometimes become broken, and fall to the earth…[Providence Daily Post, Rode Island, September 3, 1859]. …There was another display of the Aurora last night so brilliant that at about one o'clock ordinary print could be read by light…Boston, Friday, September 2 [The New York Times, New York Herald, Washington Daily National Intelligencer, Friday, September 2, 3, 5, 1859]. …It was reserved for our days to have a sage and philosopher to make clear to our comprehension the wonderful mysteries of those lights, which the Scotch know as merry dancersbut with which we are more familiar by their Latin name of aurora borealis, to show us that they are nothing more nor less than an industrial exhibition of the upper air, a silkery [sic] in the clouds, whereat the magic shuttle flies from horizon to zenith with a speed that leaves electricity lagging far behind, and to be prepared to exhibit to the incredulous world a piece of the product of these heavenly looms. Phenomena are not supposed to have any reference to things past --- only to things to come. Therefore, the aurora borealis cannot apply to the battle of Solferino or the peace of Villaranca. It must be connected with something in the future --- war, or pestilence, or famine. They may be connected in some way with volcanic eruptions, or earthquakes, or, as has been long supposed, with icebergs. As philosophers are unable to solve the problem, why do not the aeronaunts try it? Wise and La Mountain have been threatening transatlantic voyages. Suppose that, before they start for the other side, they would ascend in their balloons and try to get a glimpse of the foundation line of the aurora borealis…[New York Herald, September 5, 1859]. …Aurora appeared, illuminating the city so brightly as to draw crowds into the streets…[New York Times, September 5, 1859]. …But two hours later, when the light, as a whole, was at its greatest brilliancy, the northern heavens were perfectly illuminated, with the exception of a few dim and almost imperceptible white streamers, which passed from the zenith nearly half way down to the northstar [sic] . At that time almost the whole southern heavens were in a livid red flame, brightest still in the southeast and southwest. Streamers of yellow and orange shot up and met and crossed each other, like the bayonets upon a stack of guns, in the open space between the constellations Aries, Taurus and the Head of Medusa - about 15 degrees south of the zenith. In this manner - alternating great pillars, rolling cumuli shooting streamers, curdled and wisped and fleecy waves - rapidly changing its hue from red to orange, orange to yellow, and yellow to white, and back in the same order to brilliant red, the magnificent auroral glory continued its grand and inexplicable movements until the light of morning overpowered to radiance and it was lost in the beams of the rising sun…[New York Times, September 3, 1859]. …Early in the evening from the east there came a faint light, like that preceding the rising moon, while in the west a delicate crimson seemed to be thrown upwards, as if from the sun, long since gone down. Later, these strange fires overran the entire heavens -- now separating into streamers, gathered at the zenith, and forming a glorious canopy - then spreading evenly like a vapor, shedding on all things a soft radiance; again, across the sky waves of light would flit, like the almost undistinguishable ripple produced by the faintest breeze upon the quiet surface of an inland lake; a pale green would now cover half the firmament from the east, while rich crimson met it from the west - then the ruddy light would concentrate itself at the zenith, while beneath it fell in folds of beauty the mild purple and green. To the east and to the west lay huge fields of luminous clouds, tinted with a bright rosy flush, wholly unlike that produced by the rising sun and if possible even more beautiful. Soon, as Everett has beautifully spoken of a somewhat similar scene, "the hands of angels shifted the glorious scenery of the heavens." The mass of apparent, red cloud to the east moved away southward, gradually failing, while the corresponding red clouds on the west seemed to sink into a chaos of dark cloud that, with a fringe of blue, skirted the western horizon. - Sheets of the same white luminous cloud again illuminated the sky, producing about the same amount of light as the full moon, and the night became almost as the day. The aurora borealis is today the chief topic of conversation, and all agree that they have seldom or never witnessed so extensive and remarkable an atmospheric phenomenon…[Cincinnati Daily Commercial, September 1, 1859]. …Half-past eleven. The appearance now is positively awful. The red glare is over houses, streets, and fields, and the most dreadful of conflagrations could not cast a deeper hue abroad…[San Francisco Herald, September 5, 1859]. …The whole sky appeared to undulate something like a field of grain in a high wind; the waters of the Bay reflected the brilliant hues of the Aurora. Nothing could exceed the grandeur and beauty of the sight; the effect was almost bewildering, and was witnessed with mingled feelings of awe and delight by thousands. Nebulous matter, like that which furnishes material for meteoric showers, or the zodiacal light, and is known to exist in the planetary spaces, is probably the cause of these displays. He regards the light as emitted by the friction of the earth, plunging with its atmosphere, through this vapor, the velocity being sufficient, despite the rarity of the materials, to develop the luminosity…[San Francisco Herald, September 5, 1859]. …Large print could no doubt have been easily read, for we can testify that the time on the face of a watch was easily legible…[Washington Daily National Intelligencer, September 3, 1859]. …On Thursday night last about eleven o'clock our attention was attracted by the red appearance of the sky in the N. East, which we at first supposed was the reflection from a fire in that direction, but it began to spread on both sides and was pronounced by those who knew, to be the Aurora Borealis or Northern Light. About half past eleven it began to assume the appearance of day breaking and in an hour it was almost as light as day, the stars, which before shown brightly being invisible; at one o'clock the light began to fade and in an hour the heavens had assumed their usual appearance and the stars shown out bright as ever, and, turned in…[Rocky Mountain Gold Reporter, September 3, 1859]. …It is an indisputable fact that old topers, wholesale consumers of the alcoholic fluid, whose capacious stomachs could retain an enormous quantity of the "creature" without their heads or legs being in the least affected by it, have fallen dead drunk last night and last Sunday night, before they had imbibed their regular allowance, and through no other cause than the mysterious influence upon their system of the unexplained electrical phenomenon, shining overhead…[New Orleans Daily Picayune, September 3, 1859]. …The northern sky, for an extent of some forty five degrees, was luminous with a mass of red light, from whence shot up towards the zenith the usual streaks, at times vivid and beautiful…[New Orleans Daily Picayune, September 3, 1859]. …again appeared in most resplendent brilliancy in the northern horizon last evening, being visible for a while just before and after the hour of midnight. The fainter or yellow lines of upshooting light could be clearly distinguished in the bright red illumination which extended wide around, lighting up the sky in such a manner as led the unmindful and even some of the fire companies to suppose that part of the city was about to be burnt out in a grand conflagration…[The New Orleans Bee, September 2, 1859]. …Singular as it may appear, a gentleman actually killed three birds with a gun yesterday morning about 1 o'clock, a circumstance which perhaps never had its like before. The birds were killed while the beautiful aurora borealis was at its height, and being a very early species --- larks --- were, no doubt, deceived by the bright appearance of everything, and came forth innocently, supposing it was day…[New Orleans Daily Picayune, September 9, 1859]. …All our exchanges, from the northern coast of the Island of Cuba (from the southern side we have none so late,) come to us with glowing descriptions of the recent Aurora Borealis, which appears to have been as bright in the tropics as in the northern zones, and far more interesting. The sky was no more, or at least but for a moment, completely lit up from the horizon to the pole, but the light came and went, now here, now there, now in this direction, now in that, and each time varying in outline and brilliancy. During the three hours which followed it seems to have had almost every latitude and longitude possible in its field, and to have described every possible figure…[New Orleans Daily Picayune,September 7, 1859]. .…The French telegraph communications at Paris were greatly affected, and on interrupting the circuit of the conducting wire strong sparks were observed. The same thing occurred at the same time at all the telegraphic station in France…[The Illustrated London News, September 24, 1859]. …Never in my experience of fifteen years in working telegraph lines have I witnessed anything like the extraordinary effect of the Aurora Borealis between Quebec and Farther Point last night. The line was in most perfect order, and well skilled operators worked incessantly from 8 o'clock last evening till 1 this morning to get over in an intelligible form four hundred words of the report per steamer Indian for the Associated Press, and at the latter hour so completely were the wires under the influence of the Aurora Borealis that it was found utterly impossible to communicate between the telegraph stations, and the line had to be closed. The same difficulty prevailed as far south as Washington…[Rochester Union & Advertizer, Tuesday Evening August 30, 1859]. …The New York operator, J.C. Crosson, reported as follows: On Sunday evening last, at 7-1/2 o'clock, I experienced considerable difficulty in working on account of the variation of current. Upon looking out the doors I perceived broad rays if light extending from the zenith toward the horizon in almost every direction. I then concluded the difficulty arose from the mysterious influence of the Aurora Borealis…[Cincinnati Daily Commercial, September 7, 1859]. …The telegraph operators throughout the east report a very brilliant display of auroral light, which though very fine to look at, has as usual greatly hindered the transmission of messages over the wires…[Philadelphia North American & United States Gazette, Monday Morning, Aug. 29, 1859]. …Lousiville KY, August 31-The telegraph wires between this city and New York, as also throughout Canada, were interrupted by the unusual overcharge of electricity which always pervades the atmosphere during the continuance of this phenomenon…[The New Orleans Bee, September 1, 1859]. …The wire was then worked for about two hours without the usual batteries on the auroral current, working better than with the batteries connected. This is the first instance on record of more than a word or two having been transmitted with the auroral current…[Washington Daily National Intelligencer, Tuesday, September 6, 1859]. …Who now will dispute the theory that the Aurora Borealis is caused by electricity…[Washington Evening Star News, September 2, 1859]. …During the auroral display on Thursday night in Boston some curious phenomena were witnessed in connection with the telegraph wires. The following conversation, says the Boston Traveler, between the Boston and Portland operators on the American telegraph line, will give an idea of the effect of the Aurora Borealis, on the working of the telegraph wires: Boston operator, (to Portland operator)--"Please cut off your battery entirely from the line for fifteen minutes." Portland operator-"Will do so. It is now disconnected." Boston-"Mine is disconnected, and we are working with the auroral current. How do you receive my writing?" Portland-Better than with our batteries on. -Current comes and goes gradually." Boston-"My current is very strong at times, and we can work better without the batteries, as the Aurora seems to neutralize and augment our batteries alternately, making current too strong at times for our relay magnets. Suppose we work without batteries while we are affected by this trouble." Portland-"Very well. Shall I go ahead with business?" Boston-"Yes. Go ahead." The wire was then worked for about two hours without the usual batteries, on the auroral current, working better than with the batteries connected. The current varied, increasing and decreasing alternately, but by graduating the adjustment to the current, a sufficiently steady effect was obtained to work the line very well. This is the first instance on record of more than a word or two having been transmitted with the auroral current. The usual effects of the electric storm were manifested, such as reversing the poles of the batteries, etc…[The Daily Chronicle and Sentinel, Augusta, Georgia, Thursday AM, September 8, 1859]. …There were strong currents of electricity observed on the wires, to which no batteries were attached, and some extraordinary electrical phenomena, difficulty of explanation, noticed…[New Orleans Daily Picayune, Saturday, September 3, 1859]. …Friday morning last, the morning of the last auroral borealis, the operators of the National Telegraph office in Washington City found, on going to their business, a series of electrical currents, entirely independent of the batteries, in possession of the wires. These currents seem to have been manageable, for the operators actually went to work and send messages from New York to Pittsburg, PA., correctly without the use of a particle of galvanic battery, using this independent electricity of the air in the place of that supplied by the ordinary batteries…[New Orleans Daily Picayune, September 9, 1859]. …Crowds of people gathered at the street corners, admiring and commenting upon the singular spectacle. Many took it to be a sign of some great disaster or important event, citing numerous instances when such warnings have been given…[New Orleans Daily Picayune, Monday, August 29, 1859]. …The influence of the Aurora Borealis has been felt in the Garden District. We see in the police reports, this morning, that several denizens of that delightful spot have been found drunk --- many under a strange delusion, having taken the gutter for their own comfortable beds…[The New Orleans Daily Picayune, Wednesday, September 7, 1859].